Cling is simple - let us show you how to use it. With Cling, you place everything you want on boards. A board is similar to a conventional pin board – which starts empty and has space on it for attaching everything you wish to retain. It means that with Cling, you put together your content piece by piece in order to always have it directly at your fingertips. Besides being able store everything there, Cling lets you collect and organize everything at the one place and – if you like – also lets you share this with others. 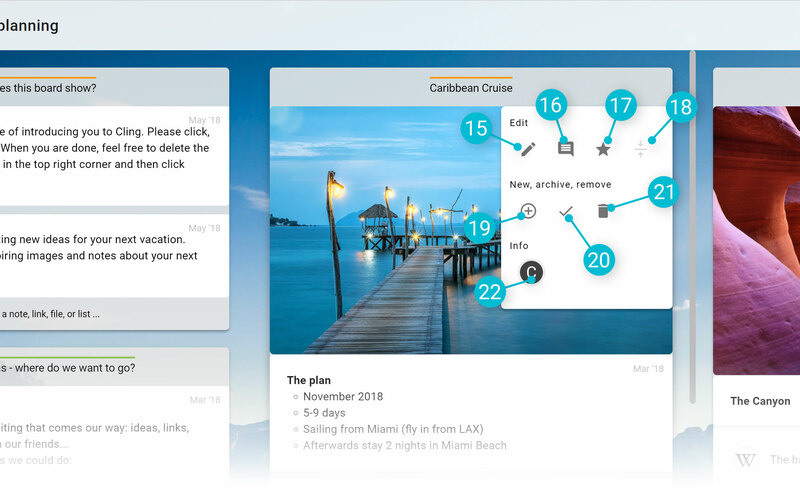 Clings is comprised of four main elements: your home screen, your boards and any number of lists with their various cards. The first thing you see after logging in to Cling is your home screen. Initially you’ll only see the boards that have already been placed there to let you learn about Cling more easily. If you want to know how to set up your home screen quickly, check out our video. But you can simply create as many boards of your own step-by-step to obtain a perfect overview of all your subjects of interest. Do this by clicking on the button “New board” ❶. You now have a fresh new board for which you now need to assign a name. To personalize your board, you can also select a background image or an individual color scheme, if you wish. So that things don’t get cluttered on your new board after collecting lots of content, Cling features so-called lists. Imagine these as being folders into which you can place your notes, files and bookmarks. Create your first list by clicking on “Add first list” ➋. Give your list a name – and now you are already set to collect the first content on your board. The actual content is displayed in Cling on cards. There are various different types of cards, which are optimized for specific types of content. Create a card with a click on “Add note, link, image or list…”. A small menu with options will open, allowing you to select the element of your choice. Congratulations. You now know the most important Cling elements and can get going. Notes and texts: note cards ❸ are there for all your thoughts, notes, and ideas. To keep things clear, they incorporate just a small, lean editor providing the most important functions. You can find detailed information in the “Notes, photos & files” section. Links and bookmarks: all web addresses that you want to remember can be saved on link cards ❹. You can create the cards by either copying the link manually or – much more conveniently – by using the Cling bookmark button, our extension for your browser. All further information on working with bookmarks can be found in the “Bookmarking” section. 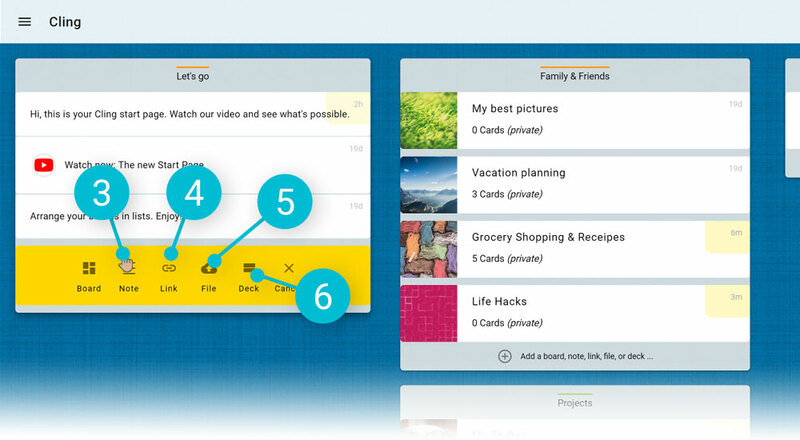 Photos and files: Cling lets you permanently store all files that are important for you. Furthermore, Cling can also manage your photos. File cards ❺ are used for both. They allow you to upload one or more files. Photos are displayed directly in Cling. Files are illustrated with the icon of the respective file format. More detailed information is available in the “Notes, photos & files” section. Lists: so that you maintain the best possible overview, you can also create new lists ❻.
Cling provides various features making it easy for you to manage your content in such a way that ensures you always have a complete overview. To move a card, click anywhere on the card and keep the mouse button pressed while moving it to the required position on the board at which point you release the button. Entire lists can be moved by “grabbing” the grey title bar, which also contains the name of the list. If you wish to move several cards at once, it may be easier to attach these with one another beforehand. More on this subject is outlined in the “Working with cards” section. At the top right of every board is a menu providing access to important basic functions. A click on the overview ❼ icon makes all lists collapse. You then see only their names and how many cards they each contain. This is especially practical for maintaining a clear overview on large boards. The clipboard ❽ lets you move your content back and forth among various boards. The clipboard column opens once the icon is clicked. Move the lists or cards you want to move into this column. Then, change to the board to which the content is to be moved, open the clipboard and drag the content to desired position. The incoming ❾ column is your depot for all links that you save using the Cling bookmark button while surfing the net. They are saved as link cards in the incoming column of the respective boards. Each board has its own incoming column. More information on this is available in the section dealing with bookmarking. The settings ❿ allow you to adjust the name, background, pattern and color of a board. Each board can be shared ⓫ to let others work on it together with you. More on this is contained in the “Teamwork” section. Clicking on the star ⓬ means that only important cards are to be displayed. Any card you deem as being important can be marked as such (see below at “Working with cards”). By hiding all other cards, you can concentrate fully on those of particular relevance. If cards are archived, these are then hidden to ensure your boards retain the maximum clarity and remain up to date. A click on the “Display archived cards” ⓭ menu option, however, will let these cards be displayed again. You will find all deleted lists or cards in the trash ⓮. If necessary, you can easily drag these back to a board. Your boards will become considerably clearer if you arrange your lists over several columns. To create a list in a new column, move the mouse pointer to the top-right of an existing list, click on the three dots and then at “New” on the arrow pointing right or left. This creates a new column that already contains a first list. You can either fill this list with content or drag an existing list into this new column. Incidentally, columns are also the method of choice for depicting Kanban workflows in Cling. An example would be a task board with the lists “Open”, “In progress” and “Done” positioned next to each other. 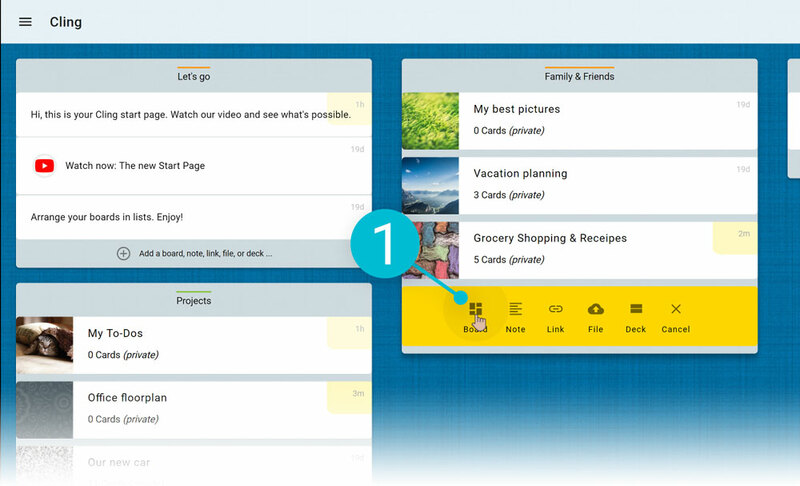 Each new task would be created as a note card in the “Open” list. As soon as you begin to tackle the task you move it to the “In progress” column – and over to “Done” when it’s completed. If you move the mouse pointer over the top-right corner of a card you can click the pencil icon and then have the possibility to edit the card. Or you click on the three dots, which causes the card menu to open. The content of a card may be edited by clicking on the pencil icon ⓯. An even easier way of doing this is by simply clicking directly in the card’s content. Add a comment ⓰ to a card. Comments can be used for your personal notes or for communicating on your content with others. More on the Cling teamwork functions can be found in the “Teamwork” section. A click on the star symbol ⓱ lets you indicate that a card is important. At the top of each board there is also an identical star icon. By clicking on this, all cards that are not indicated as being important will be hidden. If two or more cards belong together, these cards can be attached to each other ⓲. This minimizes the line between the cards, thereby indicating the association. Moreover, the cards can now be moved as a single block. The Add ⓳ section lets you create a new note, link and file card, or a new list. The new card will appear directly below the currently active card. With the creation of a new list, the current list is divided into two separate lists. One of the most useful Cling functions is the facility to archive cards. All cards that you no longer actively require can be “checked off” ⓴, as needed. From then on, they will be hidden – but will still be there if you need them later. To display them again, click on the three dots at the top-right of the relevant board and select “Show archived cards”. Click on the trash icon ㉑ if you wish to delete a card. If you are working on a board with several other people, the small photo ㉒ in the “Info” section provides a hint to who initially created the card. 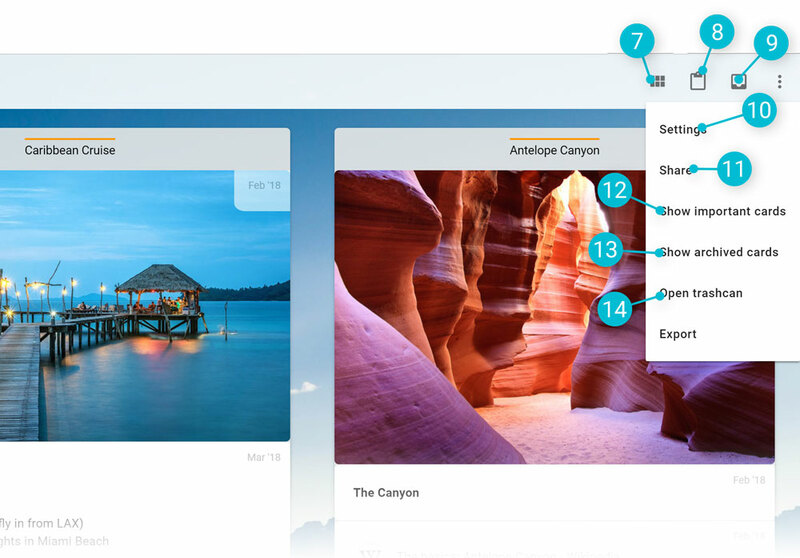 In theory, you could create boards for your various types of content: one board for your notes, one for bookmarks, one for files, and another for your photos. We recommend, however, to combine all types of content in your boards. This lets you concentrate fully on your subjects and allows you to work on a single board for each of your hobbies or professional projects. You then have the complete overview and access to all the relevant content on each subject at a single place. That’s what sets Cling apart. Share any board with selected persons. The person will receive an email inviting them to work together on the board. Naturally, this access may be withdrawn by you at any time. Date stamps on every card let you identify new content. Use the comments function to initiate a discussion directly at the relevant card. You’ll receive an email as soon as someone answers to your comment, ensuring the conversation stays alive and that you’ll reach your goal faster. The “Teamwork” section provides detailed information on how you can best work together in Cling.